The new generation of Alphacool NexXxoS radiators, a name that is known for experience and quality, is here to breathe new life into the radiator market! Everyone who uses watercooling needs a radiator, and everyone has different requirements for the heat exchanger. Naturally, consumers want the product that's best in class. The Alphacool NexXxoS radiators are here to challenge the best in their class, and be crowned the best radiators in every area and size. No more back and forth - with Alphacool NexXxoS radiators, you know what you're getting! Alphacool has been a trendsetter on the scene for developing and improving radiators for years. That's why these models are among the first radiators to really earn the descriptor "full copper"! All the main elements, not just the fins and channels, but also the channel heads are made of copper. Material-wise, this is a big advantage, and one where other radiators fall by the wayside. The Alphacool NexXxoS X-Flow radiators set themselves apart significantly from conventional radiators in their construction. The X-Flow radiators are built for high flow rates. The slanted copper chambers on either side are built identically. This means the water can flow through all the channels at the same time until it flows into the opposite chamber and leaves the radiator. Freedom in the installation is one of the central points on which Alphacool's development department focused. Both copper chambers have three 1/4" threads. That means connections can be attached on the top, bottom and at the front or back (not on the NexXxoS ST30). Fewer angles are needed, which increases the flow rate and offers more options in the installation. 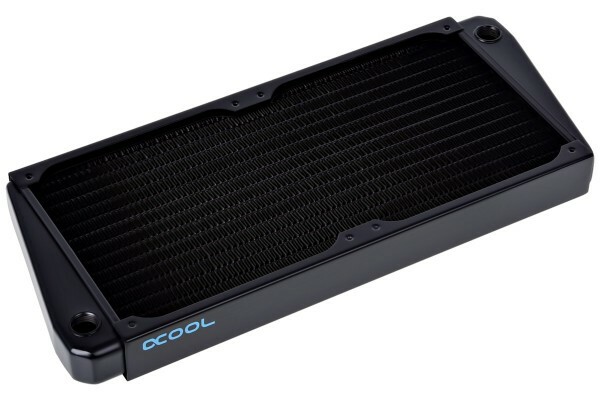 Here, too, Alphacool carries the standard sizes of the 120mm series. Different strengths, 30mm, 45mm and 60mm underscore the wide spectrum that these radiators cover. The installation of the radiators, as well as the fans and radiator faceplates, is easy to do with this series: the M3 threads are standard in the radiator sector, affordable and available in all lengths. Even the dreaded mishap of turning the screws in too deeply won't lead to costly damage with this radiator: an inner protective edge stops the screw before it can come into contact with the fins. The fin spacing was chosen so that the radiator could reach its optimal cooling performance even with slow or medium-speed fans. This is not only comfortable in terms of background noise, but also puts no constraints on the choice of fans. All in all, it's where experience and powerful performance meet with a forward-looking approach and sophisticated solutions. Alphacool NexXxoS Radiators - the one tool for all your cooling needs!